While Roman is still on blogging holiday until he returns home from the NOVA OPEN 2016, we hope you are not getting too bored with the jungle's slower pace these days. If so, check MV's tutorial section for great articles! while Roman is still on blogging holidays until his return from his short US trip, we got splendid news concerning the NOVA Open 2016. 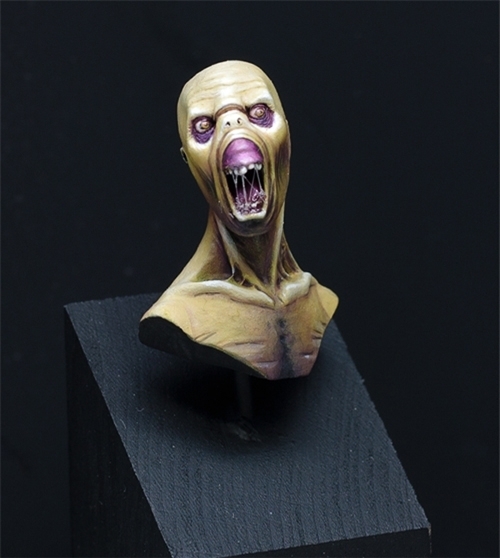 One of Roman's seminars in DC is called "Roman's Speedpainting Masterclass" and is teachig students how to paint up a Zombie in about 15 minutes. 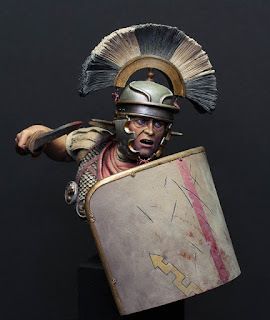 Therefor Roman was in need of plenty of Zombiemodels for his students. 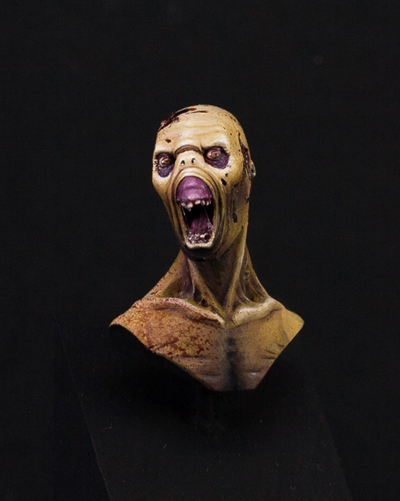 ... we'll have a good stock on Zombies we can throw colors on. Massive Voodoo is getting excited! NOVA OPEN 2017 is approaching! Make sure to enter the Capital Palette Painting Competiton! This interview was formerly posted on NOVA Open's facebook page, but the jungle thought to copy it in here too! Enjoy! 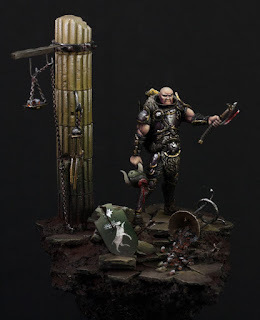 Recently, the NOVA Open had a chance to talk with Raffa "Picster" Picca and Roman "jarhead" Lappat, the co-founders of Massive Voodoo, "a blog by a group of friends about the passion of miniature painting and sculpting." 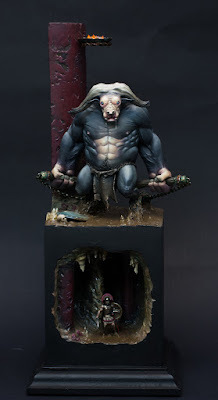 As friends and co-founders, Raffa and Roman expanded the blog from a showcase of their work and teaching tutorials to a comprehensive multi-lingual resource for painting and creating miniatures that allows individuals to learn about topics ranging from the theory of painting to approaches for sculpting miniatures. The artists have also turned the website into a storefront for the Massive Voodoo team's miniatures and have published an art book titled Figure-Art showcasing their impressive work. 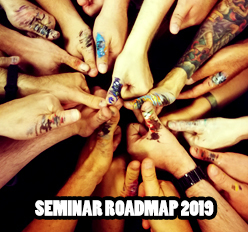 Project Log: "The Last Light"
Participants interested in these classes should register as soon as possible, classes such as Roman's Blending School have already sold out and have a waitlist. Massive Voodoo will also be generously donating two miniatures each for the NOCF charity raffle: Raffa will donate "The Great White Werebull" and "First Ranger Mira" while Roman will donate "Crashed X-Wing" and "Kill. Humans." The NOVA Open is excited to have Raffa and Roman contribute their immense talents to the convention and NOCF. Check the NOVA's Charity Foundation! 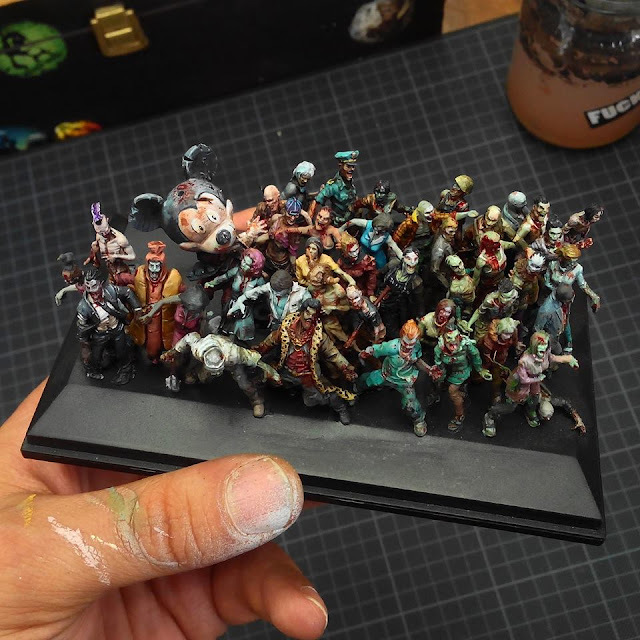 Read below to learn more about the founding of Massive Voodoo, their insights into the process for painting miniatures, and the artists' seminars for NOVA Open 2016. 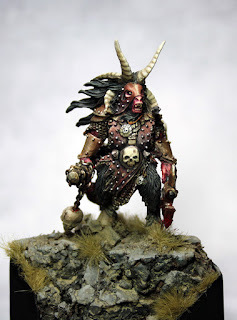 "A Living Room of Friends Sharing the Same Passion"
Massive Voodoo grew from Roman's idea to create a blog that showcased his work and tutorials for painting miniatures, an idea that Raffa helped shaped. As Raffa noted, "we were having a chat, and I said to him, "why don't you use a blog, I think it would fit much better to what you want to do." After launching the blog in September 2009, Raffa and Roman decided to invite their friends to collaborate on the website. "It was a bit boring to do it alone," Raffa said, so "we started to invite friends and basically it was a living room of friends sharing the same passion." As Massive Voodoo has grown, the artists have found that their audiences' growth as miniature painters and sculptors has been the most fulfilling component of operating the blog. As Raffa explained, "if you see the progress of regular visitors - and the way they lose the fear of doing things wrong and try out new things - that's the best part." In light of these successes, the origin of its name remains a mystery. "No one exactly knows why it was called Massive Voodoo," Raffa said. "We needed a name and then we found a name," Roman added, laughing. The artists' work through their website has allowed them to note evolutions in painting styles across the world over time. "When I think back when I started, the differences in the styles were much more visible, like the French style, the Spanish style," Raffa noted, "but these days, the styles are more mixed." According to Roman, the melding of these styles emerged from the miniature communities' willingness to share tips and ideas online. As he observed, "nobody is saying, 'hey, I'm keeping my secrets.' Everyone is sharing their ideas and I think that leads to a better mix of different styles." 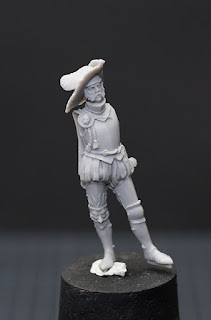 Letting the Miniature Speak to You: The Artists' Inspiration for Painting Miniatures and Advice for Other Hobbyists. While Roman and Raffa have refined their painting techniques over time, the two artists explain that letting their intuition guide the painting process plays a major role in their work. As Raffa explains, "I don't try to think too much about color schemes, I just try to paint the way the miniatures are talking to me. If you look at the mini, often times you already see the story you want to tell other people." Roman agrees, noting that "it's a vision you receive from the model and then you just paint it." The artists' emphasis on letting intuition play a role in painting miniatures extends to their advice for other hobbyists. I would say it is important if you start painting, try to know where you are on your path. 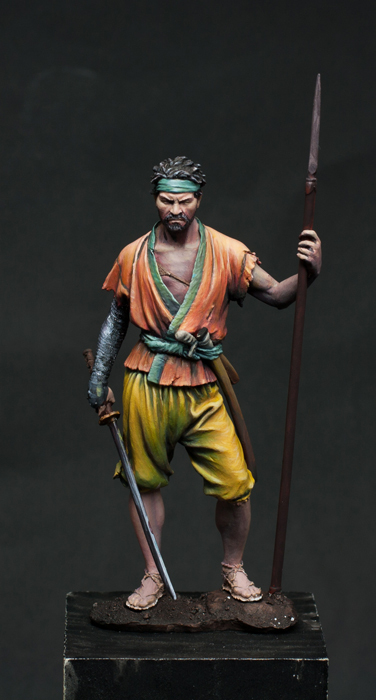 You're walking a path as a miniature painter like you're walking a path as a guitar player. You start to play the strings, then you learn another song. You're growing and going forward in your journey. That's the same for miniature painters. And very often people compare themselves to other people who are much further on their own personal journey and they get frustrated. So know where you're walking on the path. Roman agrees, noting that painters should also "play around" with different painting styles and see what works for them rather than rigidly following one approach. "Maybe wet blending is not your thing, maybe you like glazes, or the other way around," he said, "but if you never try it out, you will never find out." This year, Raffa and Roman will serve as instructors for ten courses and donate two models each to the NOCF raffles. The artists drew inspiration from video games and found objects for their NOCF models. 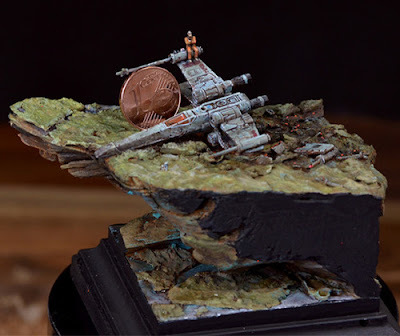 Roman's "Crashed X-Wing" came from a moment of inspiration that turned a former student's gift into the miniature. After a student gave him a miniature of the Star Wars ship, Roman kept it in a drawer for two years since he could not find the right idea for the miniature. After seeing some garbage on the street however, he said "I thought that it looks like a planet and a place to have the X-Wing crash there. So I was inspired by garbage." The inspiration for Raffa's "First Ranger Mira" model came from a mage in the Witcher 3 video game: "I tried to use her as an inspiration and recreate it with red hair and a green color scheme," he said. The artists are also looking forward to helping their students improve their skills as artists and sculptors at their NOVA Open 2016 seminars. 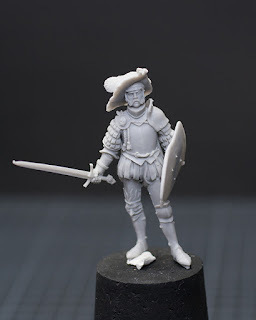 In addition to "Laid Back Speed Painting," Raffa is excited about "The Birth of a Miniature" seminar since it will "show the process of a complete figure basically from start to finish, from the first drawing of an idea to the finished product." The artist said the course reflects his growing interest in miniature sculpting. 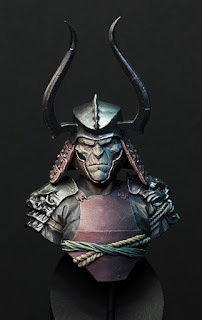 "It's the thing that I'm doing the most - sculpting, creating my own concepts, and casting," he said, noting that he works resin and silicone for casting and different clays and putties for sculpting. Roman also is excited about "Roman's Blending School" since he believes it will address the frustration that many painters feel "from their blending technique or their blending results." 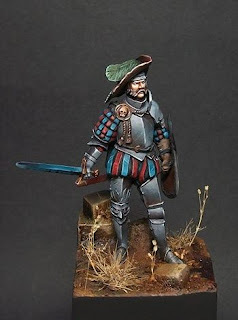 In order to address this issue, his seminar will use a unique approach where students work on color transitions on canvas before applying these concepts to miniatures. "This will be a fun class that teaches many blending techniques," he said, "but it also takes away being scared of blending mistakes. So I'm looking forward to it because it gives participants a lot of freedom when they're at home working again." The NOVA Open and NOCF would like to thank Raffa and Roman for generously giving their time and effort to support our work and causes. See you all in a couple of days in DC for a great and amazing time at the NOVA OPEN 2017! today it is time for another review on MV. 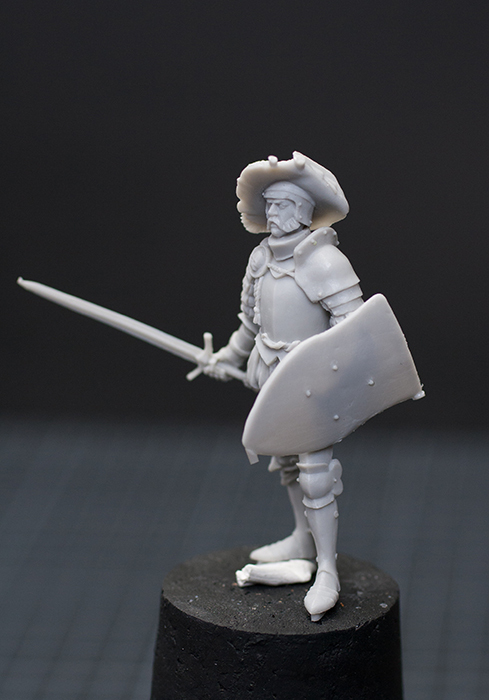 If you are interested in getting to know more products we regularly use, check the overview on the Miniatures/Material Unpacked, in short MU. 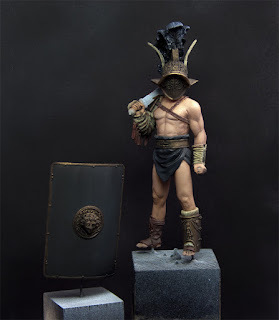 This is review #86, but it will not be about the nicely wraped parcel, we announced in the last MUs, as Roman is presently taking vacation time from the blog until end of August. Today we will have a look on Meinolf, the Last Captain, sculpted by Jorge Ayora (Ayora Studio). The first look at the parts reveal a very good quality in sculpting and casting. There are only a few places where you have to remove small remains of resin. 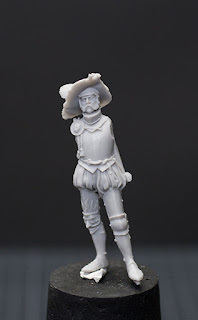 Especially the body is highly detailed and very interesting due to it´s simplicity. 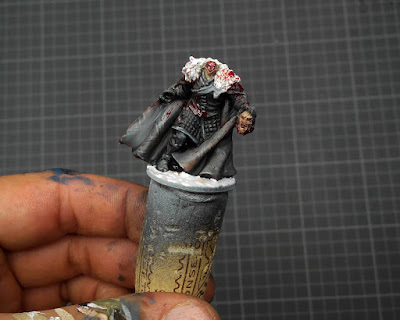 If you are interested in painting metallics and create a nice contrast with fabric texture, we can highly recommend to give this miniature a try. Both arms with the armaments follow the high quality of the body. Almost all remains of resin are found on the sword and the shield. As you can see, it´s not a big deal to remove them. But here some advice. 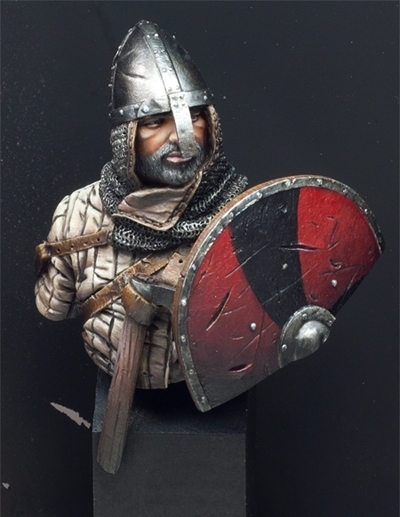 The shield offers a nice area for freehands as it´s without any decorations. As you can see on the pictures below, we found a little hole in the shield. This is not very surprising as the resin is very thin in this area. Either you can fill it up with Miliput or - as Peter will do - use it for an arrow, which has hit the shield. The most important part of a miniature is its face. Our captain looks very determined. As the face is not covered by a helmet you will have a lot of fun while painting it! 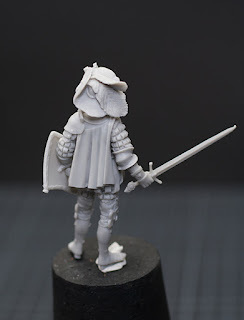 Assembling the miniature is very easy. The parts fit perfectly and with a small amount of superglue you will be ready for priming in about 20 minutes. Here a look from four different angles at the assembled Meinolf (without cleaning or the scabbard as he will move back into Peter´s shelf for a moment). 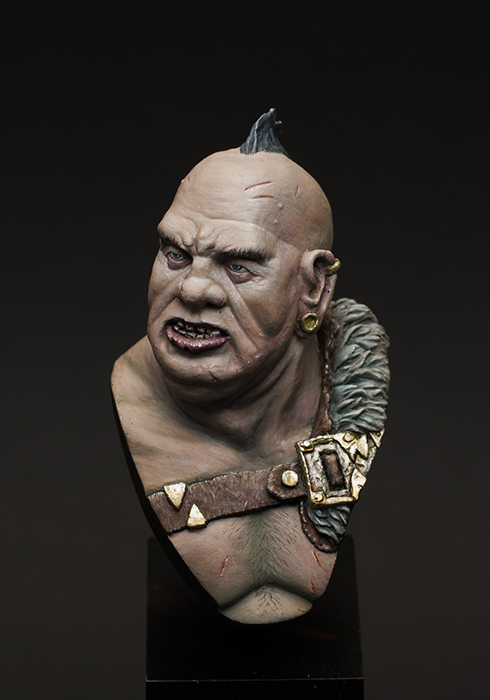 If you want to get your own copy of Meinolf, the Last Captain, have look at the shop of Ayora Studio. Peter is very happy with his copy and eager to paint it. But at first he has some other stuff which cries for being finished. But he has already prepared his collection of inspirational pictures on Pinterst. 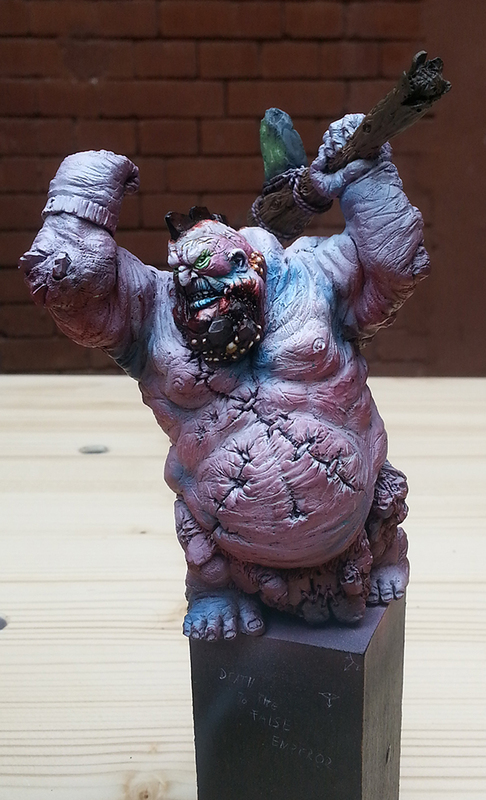 as you all know, MassiveVoodoo is a community of painters who share - together with our common hobby - a close friendship. Over the years all of us have evolved in their skills, thanks to the great chance of exchanging experiences and knowledge during long painting nights. We want to encourage all of you, to keep on happy painting and to stay hungry for new knowledge. Improving in your painting is not a question of talent, it´s more about regular practice and patience. None of us was born a good painter, we just evolved over the years. 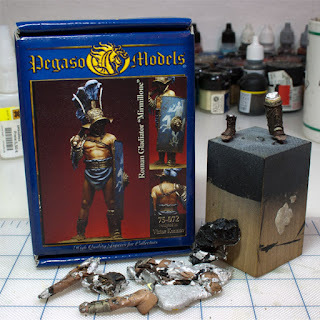 So, Peter thought, it might be interesting for you to see, from which level he came, when he started painting display miniatures and how his experiences have affected his models over the years. As I have written in my self-description, I started painting display miniatures back in 2007/08. Before, I was a tabletop gamer and did some commissions while doing my studies. It feels like a lifetime ago, but thanks to my hard drive and the internet, I have found some old goodies. Let´s do a little journey through my gallery which developed very much in the last years. As you will see, I started like all of you: simple paintjobs, but enjoying the hobby very much. 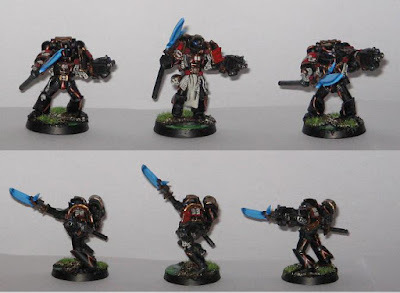 The oldest picture I could find: my Grey Knights. Up to 2006 I was a regular gamer, but already cared very much about the look of my army. 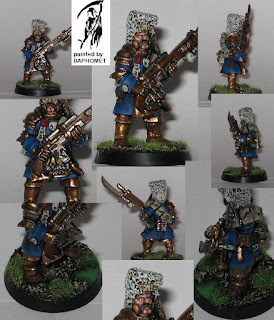 After my first armies (Warhammer Fantasy & 40k) where painted very quickly and efficient, I wanted my "Grey" Knights to appear more outstanding. 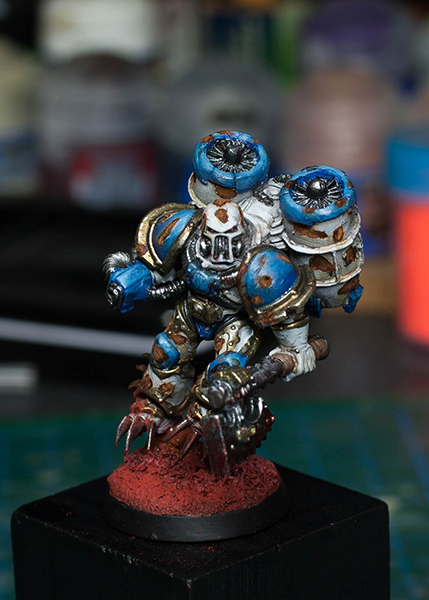 I already had some years of painting experience and while working in the local GW-store in Augsburg and with the help of some gamer friends, I improved my techniques a lot. As you can see on the pictures, I was trying to make the armour look like made of cold lava, with some still hot, molten spots. 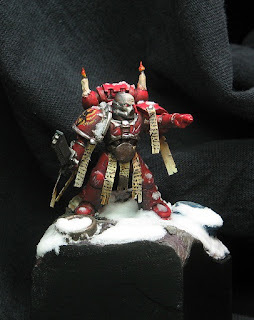 These miniatures where all done, when I met Roman for the first time, back in spring 2006. 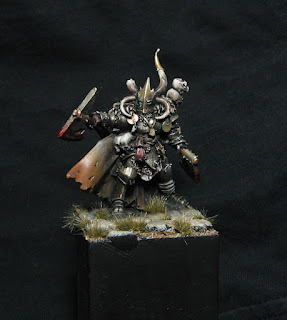 In the following years we had painting nights on a regular basis and he shared his knowledge about miniatures with me. This is the only miniature I painted in 2010 due to my final exams and my 3-month-internship in Egypt. As you can see, I did not make any big progress in my skills. Time was short and sadly I had a big lack of motivation. If I recall right, I was thinking about quitting the whole hobby. Things changed in 2011. In this year, I made the biggest developments so far, which supports the theory of a high always following upon a down. I was painting a lot with Raffa and Roman, which were supporting me with advice and sharing their own experiences. As you can see in the following picture, I took my first attempts in painting zenithal light. This was one of my first historical miniatures. I had already painted a Gladiator back in 2009, but as I stripped it off paint, I call this here my first "finished" 54mm miniature. I like the leather-effect and the unwittingly slight attempts to atmosphere-painting. 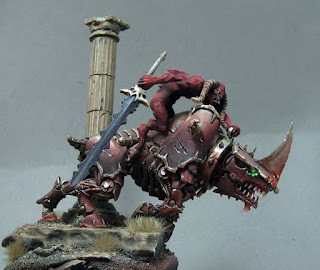 Many of you will know the "situation" when I painted this demonette. It was one of Roman´s early painting classes and the first class I have ever joined. It had the same effect on me like on so many other students. It was some kind of eye-opening event. I learnt a lot about color theory and was now able to further improve my skills. 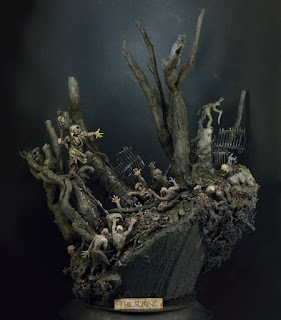 Then, my first big diorama: The Rising. At the beginning I wanted to do a complete different project, but struggled very hard with it. In April we were doing some kind of painting bootcamp with 8 painters at Raffa´s place to prepare our projects for Duke of Bavaria. 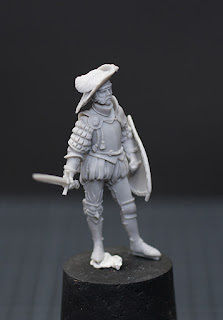 All of them invested their knowledge and gave me input for the project, Raffa even sculpted the necromancer. I call The Rising a project of friendship and it´s still one of my favourite pieces in my cabinet. In this year, I had to leave Augsburg and started my new job in Reutlingen. I still kept contact with Roman and Raffa and visited them as often as possible. But I would say it was an important step in my development as a painter. I had to use my knowledge I accumulated without having somebody in the back in case something went wrong. I also made my first attempts on busts, a Norman Knight (Young Miniatures). I joined Roman on a lot of his classes and supported him as some kind of "sidekick". It was a new experience for me. By helping his students, I was able to fix my own knowledge even when I was not painting so regularly anymore. But the classes gave me the chance to start new, simple projects and to finish them in three days. 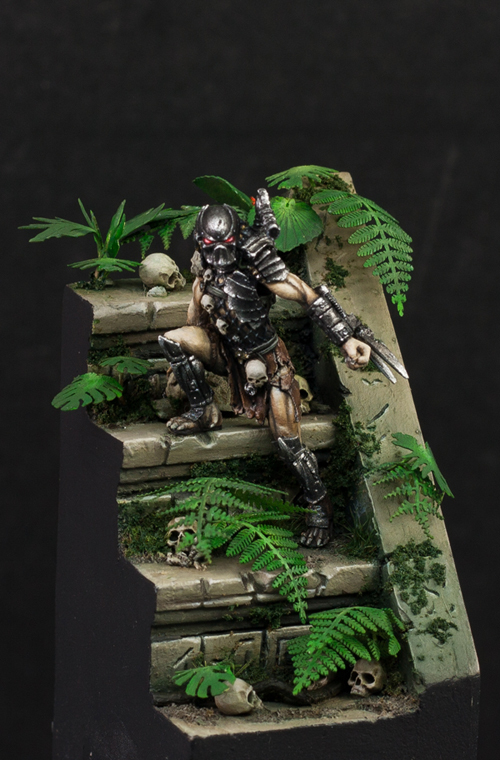 The Predator was started and finished during the Beginner Class in Schöppenstedt. The lessons learnt were already influencing my other stuff. In this time my painting style was quite dark and grim. 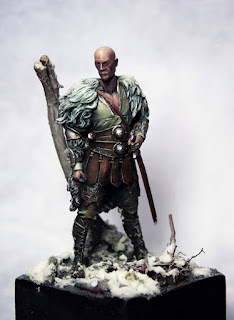 I tried to tell my stories on more and more detailed bases. I was also able to get new input. I took part in Karol Rudyk´s class in Berlin. It was an interesting experience to meet a painter with so many skills and a complete different approach towards his miniatures. If you have the chance, take part in one of his classes and enjoy the flying (word!) brushes full of colors. The most important lesson learnt: maximize contrast! In 2014 I had some of the famous "click"-moments. While painting my miniatures, somehow the experiences which I made over the last years came together, somehow making sense and pushing me foreward. Theseus´ Destiny was born out of a simple idea I developed with some friends during a painting bootcamp in my flat. I wanted to do something complete new and do "two" scenes, which are connected to each other, in a single project. My most favourite piece until today! Sha´Un was basically a study about rust. I likr beastmen very much and in my imagination these human/animals don´t care a lot about their armour. The special effects from ModelMates helped here, but I used different other materials to get as close as possible to natural rust. I also joined a class with Fernado Ruiz to get more technical input. 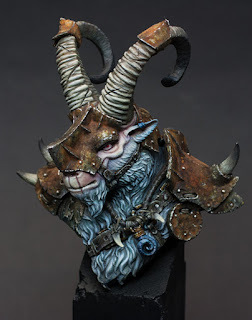 Same as with Karol´s class in 2014, it helped me push my understanding of painting further. This times, it was more about volumes and different materials. The year started with another class. 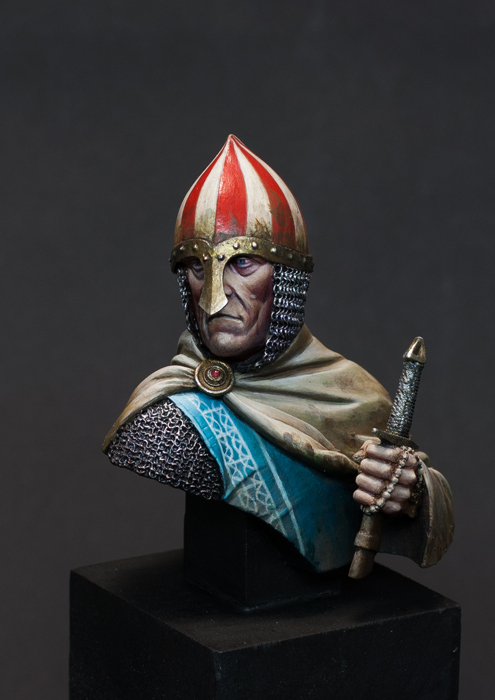 Alfonso Giraldes visited Augsburg and held a three day class with a big group of well-experienced painters. It was a fascinating weekend and my brain was full with his approach towards color and painting. I began to get rid of the ideas about the "perfect blending" and to find my fun in painting again. Just happy painting with powerful colors, not forcing yourself towards perfection. Sadly, I was pretty stressed during the rest of the year. My job was annoying and I was preparing to change it, which included moving to Stuttgart. I started some projects, but none of them got finished. 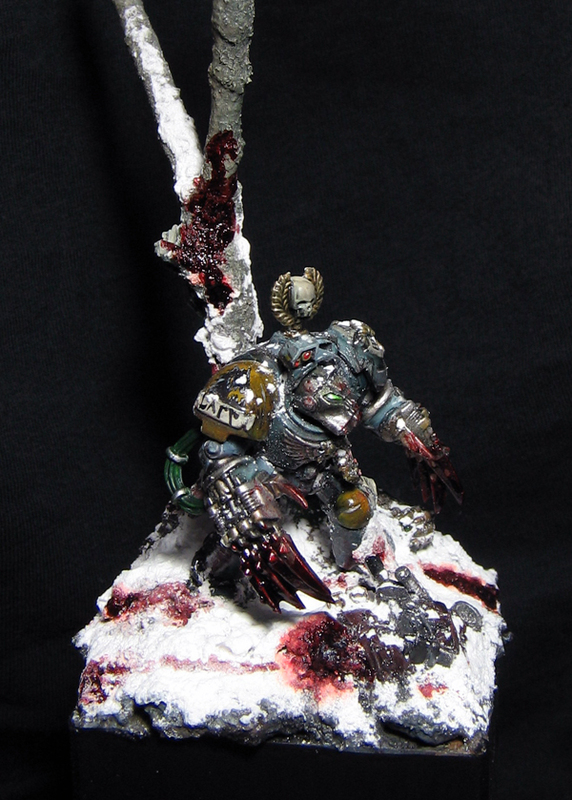 I even started a small 40k-army project, but it never made it over the first concept miniature. This year turned out to be one of my best years in painting so far. After I moved to Stuttgart and was able to visit Augsburg more often, my mood calmed and I was more motivated into painting again. Two events were very important for this: first, Roman gave me a Privat Coaching at the beginning of the year. Second, I took part in Roman´s Advanced Class. Both were mainly about painting atmosphere, but also helped me improve my techniques. I would say that because of both events, I had another, very intense "click"-moment. The two projects, I finished afterwards were much more detailed and more intense in regard to color intensity. The Roman Centurion was started in early 2015 and remained as a WiP in the cabinet for a long time. When looking at it, I can see some elements from my old way of painting, but also some first attempts in using an atmospheric painting. The Mountain Ogre was more a personal study in regards to painting details and volumes in a short time. Today, when I look at my painting table I can already see further developments. I paint more freely and without any force. I enjoy my hobby, even if it sometimes causes trouble and heavy thoughts. I have learnt, that there are always ups and downs. There is no way in changing this and no sense in even trying to force you to anything. But by ending this (quite long) article, I´m proud about the development of my painting skills over the last ten years. Development needs time, but with additional/new input, patience and practice you will go forward. Paint with friends and discuss your projects. By giving detailed feedback and sharing your knowledge you will become more sure of it and others will also have the chance to develop.